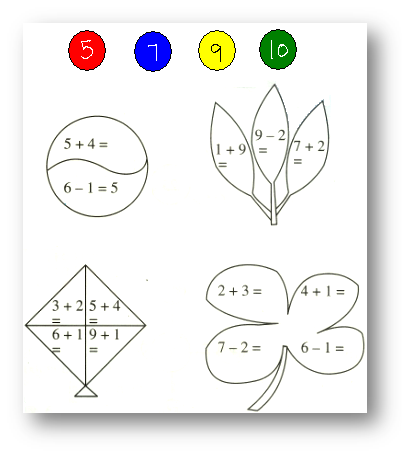 Practice mental arithmetic questions provided in the worksheet on add and subtract 1-digit number mentally. 1. There are some questions of addition and subtraction given on different parts of the objects. Try the questions. If the answer is 5, then color that part of the object blue, if answer is 7, then color that part of the object red, , if answer is 9, then color that part of the object yellow and if answer is 10, then color that part of the object green. (iv) Which is more, 9 – 1 or 8 – 1 …………? (v) What should be added to 5 to make it 7 …………? (vii) Which is more, 7 – 2 or 6 – 2 …………? (x) What should be added to 3 to make it 9 …………? (xi) Which is more, 5 – 4 or 9 – 4 …………? (xv) What should be added to 1 to make it 5 …………? (xviii) Which is more, 6 – 3 or 8 – 6 …………? (xix) What should be added to 0 to make it 8 …………? (xxi) Which is more, 8 – 8 or 8 – 0 …………? (xxiv) What should be added to 0 to make it 0 …………? Answers for the worksheet on add and subtract 1-digit number are given below to check the exact answers of the above questions on mental arithmetic.